As last year’s returning wild Pacific salmon headed upstream, scientists spawned a thought-provoking proposal about how taking less salmon might bring more benefits to both ecosystems and economies. Writing in the journal Conservation Letters, researchers from the Raincoast Conservation Foundation, Canadian and US universities, have proposed shifts to salmon harvesting in which fisheries take smaller catches of known runs closer to shore. The paper, titled Salmon for Terrestrial Protected Areas, argues there are many benefits from letting more fish come back to spawn, especially when spawning rivers are situated within parks or protected areas. 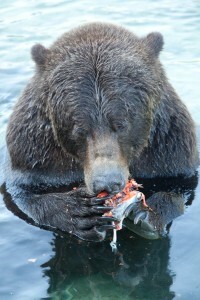 But it is not just the bears that would benefit from letting more salmon return to their natal streams. The importance of pink and chum salmon to wildlife tourism may trump their value in the commercial fishery. In October 2010 pink salmon were fetching an obscenely low 0.30/lb in B.C. super markets, yet residents and tourists were travelling the province to watch eagles, bears and wildlife eat salmon, or even just watch the salmon themselves, putting a significant amount of wildlife viewing dollars into the BC economy. The WSP is designed to protect the diversity and abundance of wild salmon, but it also recognizes the importance of these fish in sustaining other marine, freshwater and terrestrial animals. This includes their value as food for wildlife and the input of nutrients from carcasses to food webs. Fisheries and Oceans Canada (DFO) implementation of these ecosystem objectives remains outstanding largely because it means taking less fish and allowing more salmon to return to rivers to spawn, a notion somewhat contrary to traditional fisheries management. Anticipating concerns from fishing interests, the authors of Salmon for Terrestrial Protected Areas suggest that wildlife allocations be implemented gradually, starting with runs bound for terrestrial parks and protected areas and those currently closed to commercial fishing. They also advocate for higher value fisheries that can replace declines in volume. Swapping mixed-stock ocean fisheries with in-river harvesting on BC’s Skeena River has generated higher local employment and prices. Lower catches on Alaskan sockeye have also been associated with higher quality fish that fetch higher prices. High value fish and products must become the rule in the fishing industry, not the exception. Two recent legal decisions in Canada and the United States have highlighted species that utilize salmon as an important food source and recognized the need to provide these non-human consumers of salmon their own allocation. In 2008, Raincoast and other NGOs, represented by Ecojustice, filed a lawsuit charging that the Canadian federal government was not doing its job to protect the critical habitat of BC’s resident killer whales. In December 2010, a federal court judge ruled in our favor, agreeing that protecting critical habitat includes ensuring the whales have an adequate supply of Chinook salmon. As such, DFO must start allocating salmon to wildlife in its fisheries management plans. The public’s understanding and willingness to consider wildlife in salmon management is growing, as is the value of spawning fish. Incorporating these objectives into salmon management decisions will help secure food for grizzlies, resident killer whales, coastal wolves and many other salmon-dependent species. Raincoast believes there should be intensive efforts to understand the requirements of these species and ecosystems, in addition to the necessary allocation of salmon needed to sustain these values. To read the original article, please visit The Huffington Post website.